The area known as the “Sacred Valley of the Incas” is comprised between the small Andean towns of Pisac and Ollantaytambo, about a one-hour drive from Cusco. It is a succession of picturesque Andean towns, agricultural terraces, and many archaeological sites, as well as the world’s most famous white corn cultivated for export. The mild climate, the varied and dramatic scenery of snow-capped mountains, flowering meadows, lush green hills and spectacular flora and fauna, make the Valley a prime adventure destination in South America. The Sacred Valley also holds two of the most important handicraft markets of Cusco: Pisac and Chinchero. At a lower elevation than Cuzco, the Valley is a warmer and less physically taxing environment for visiting the many attractions of the region, including Machu Picchu. It is also an excellent starting point for many adventure tours including trekking, rafting, mountain-biking and horse-back riding trips. The Sacred Valley has excellent hotels. Most of the selected accommodations are located in the area from Urubamba to Ollantaytambo and are generally buildings that respect the natural environment of the area, decorated in a cozy, rustic style and providing all the modern facilities needed for a comfortable stay. Good restaurants are also opening recently following the development of this area as a tourist destination. Casa Andina Private Collection Sacred Valley is strategically located in a 3 hectare-land in the heart of the Sacred Valley of the Incas, just 10 kilometers from Ollantaytambo train station. The hotel is closer from Machu Picchu than Cusco city, as well as from the most important archaeological sites such as Ollantaytambo, Pisac, Chincheros, Moray, Maras and more. Casa Andina Private Collection Sacred Valley is one of the most complete options in the Urubamba Valley, both in services and facilities. The hotel is surrounded by gardens and green areas and it has 85 entirely equipped guest rooms, an Andean spa providing luxurious relaxing treatments with natural local ingredients and the Sacred Valley’s most exquisite cuisine. 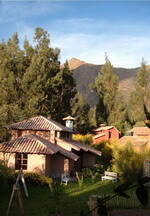 Sol & Luna is located 1 km from the town of Urubamba in the Sacred Valley of the Incas. The hotel is enclosed in a red-walled courtyard surrounded by tall eucalyptus trees and green mountains. There are 28 Bungalows: 23 doubles, 3 family bungalows and 2 suites. It also has a full-size, hard surface outdoor tennis court, where you can play under the Andean sun. The swimming pool faces the restaurant and is surrounded by cypress trees and comfortable deck chairs, a perfect place to relax after a game of tennis, after sampling treats from the Restaurant or after a luxurious treatment in the Spa. Pakaritampu Hotel is located in Ollantaytambo, 56 miles (90 Kms) away from Cusco, and one of the most picturesque villages in the heart of the Inca's Sacred Valley. The hotel offers a lovely atmosphere with cozy rooms, beautiful gardens and a superior service. Each one of the Andean houses is uniquely furnished and has been professionally designed using various multi-colored natural clays. Each is two storied, with two bedrooms/bathrooms, a spacious living room with fireplace, kitchenette, dining room, terrace and balcony. All are fully equipped to offer comfortable, complete accommodation for up to six people. Ample parking is provided as well as privacy and security. K'uychi Rumi offers a personalized service, allowing guests to completely relax within in a homey environment. More adventurous travelers can enjoy mountain trekking, cycling, rafting and horseback riding, and Machu Picchu is just one picturesque hour away by train. Casona Yucay is an old Colonial Home Hacienda built in 1810. Situated in the picturesque village of Yucay, in the heart of the Sacred Valley of the Incas, Cusco, it is a family owned and run hotel which strives at all times to provide top class service in a homely and friendly atmosphere. Casona de Yucay has a lovely Colonial Patio rounded by stone arcs. The beautiful gardens and cozy lounge with its warm fireplace and the natural breath surroundings make the hotel the ideal place for rest and peace. Teresita, the owner, is delighted to personally attend her guests. The 84-room Sonesta Posada del Inca Yucay is located in the heart of the Sacred Valley of the Incas, a one-hour drive from the ancient Inca capital of Cusco and close to Machu Picchu. The Sonesta Posada Yucay is a former 18th century colonial-style monastery and is surrounded by beautiful gardens. Near the Sonesta Posada are the craft markets of Pisac and Chincheros, the Salt Mines of Maras, the town of Moray, Ollantaytambo ruins and Machu Picchu. It is situated 12 km from the city of Urubamba in the picturesque community of Yanahuara. Its colonial style typical of Cusco, has been carefully integrated to the surroundings, with large and cozy rooms distributed amid exuberant gardens with a view of the mountains and the Sacred Valley of the Incas. This charming hotel is located in the heart of Urubamba town, in the Sacred Valley of the Incas, one hour driving from Cusco and 20 minutes away from Ollantaytambo. After your visits in the valley you can enjoy of the relaxing and quite atmosphere of the hotel as well as the hight quality of service. This hotel has 40 spacious and comfortable rooms. Previously called as Hostal Santa Rosa, which originally opened in 1923 with the arrival of the rail line, El Albergue Ollantaytambo is the town’s oldest hostel. Artist Wendy Weeks and her husband Robert Randall, a writer, reopened el Albergue in 1976, when they arrived in Ollantaytambo for the second time at the end of an extended two-year trip through Latin America. This lovely little cottage within the train station in Ollantaytambo hosts 7 different rooms, all charmingly decorated featuring functional en-suite facilities. It has lovely gardens, a wood fired sauna, a crafts shop and a new coffee shop with natural juices and delicious home-made cookies and brownies. Willka T’ika - Sacred flower in Quechua , the language of the Andean people - is not a hotel or hostal in the ordinary sense of the word. It was, from its inception, established as a Garden Retreat, and developed as a labor of love by Carol Cumes; in its essence, it is a living dedication to the heritage and spirit of the people of the Andes. The gardens are laid out as ‘Seven Sacred Gardens’. Each is dedicated to a different energy center, or chakra, to provide for personal meditation, healing and rejuvenation. The accommodation, merged into the gardens and constructed in colonial style from local materials, has all either been built anew, on an extension to Willka T’ika, Apu T’ika, or completely refurbished in 2005. They have a large sunlit studio, designed for Yoga but which can be used for any practice including concerts with local musicians and dance groups. Inkaterra Villas Urubamba, built in the local adobe style and located in the small hamlet of Higuspucro / Urubamba, provide a warm welcome to visitors seeking to experience the true Peru. Each full-service villa comes complete with private maid service. A luxurious breakfast, afternoon cocktails, and gourmet dinner will be served to the traveler. For lunch, either dine in one of the fine local restaurants or enjoy a three-course gourmet picnic in the countryside. Ticllabamba is former Peruvian top-model Susy Dyson’s latest venture, after having spent years absorbing the glamorous world of fashion, but above all, it is Susy’s home. Located in a beautiful, sixteenth century two-bedroom house in the picturesque village of Yucay, very close to Urubamba, it is an ideal escape to acclimatize and relax while exploring Cusco and the Sacred Valley. Part of the ‘royal estate’ of Yucay, Ticllabamba is believed to have been the property of Beatriz Coya, daughter of the Inca Huayna-Capac and was the favourite bathing place of “La Nusta”, an Inca princess and daughter of the last Inca, Sayri-Tupac. Indeed, when rebuilding they found an Inca-stone lined bath below one of the three small cascades that flows into the northern terrace of the property, which could have been the spot where “La Nusta” enjoyed her famous ‘full-bodied’ baths. Attention to detail and quality are the bywords of the rebuild, with traditional adobe, wood and stone found or made, and the furniture designed and created locally to Susy’s very charming rustic design and specification using natural materials. Susy offers only two lovely bedrooms with private bathrooms. Cookery demonstrations and courses can be held in the new kitchen, while guests can relax in any of the three converted existing pools: an Andean sauna, a cold water pool and a Jacuzzi. The beautiful gardens offers fabulous views over the Sacred Valley and also host a pergola for lounging in the sun and for out doors massages, as well as a dining area with a traditional Andean adobe oven. This is an exclusive private home stay with the hands-on, individual attention of Susy for guests seeking a distinctive lodging and travel experience in the Sacred Valley. Huayoccari is the private hacienda and residence of the Lambarri-Orihuela family, descendants of one of the most prestigious families in Cusco. Built in the Fifties, it is located 2km uphill from the main Sacred Valley road between Calca and Urubamba, amidst beautiful surroundings, breath-taking garden views over the Sacred Valley and an impressive collection of Inca and colonial art and artifacts. The house is lived-in by its owners and receives guests to private luncheons by appointment only. There are only two double bedrooms available, with hot water and 24h electricity. 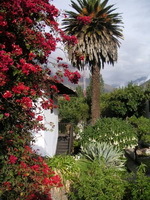 Marcabamba is a small, comfortable family-run hacienda located on the outskirts of Urubamba as one heads towards Ollantaytambo, very close to the Urubamba river bank. The Hacienda has a total of 18 hectares of land and was initially built in 1954 on a raised terrace affording it spectacular views of the river and valley. It was refurbished in 1999 and designed to receive guests. It has 8 rooms with spectacular views and en-suite facilities with hot water. Common areas include a dining room with a fireplace and meal services and a lovely outside area to have breakfast or lunch or just to relax. This is a charming rustic retreat for off the beaten path travelers seeking to enjoy the tranquility of the Sacred Valley.